eFront is, unarguably, a mature enterprise training LMS. It’s our longest standing product, with several major releases and a number of big revamps. 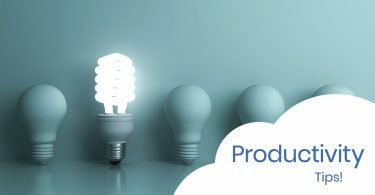 These include a full rewrite a few years ago, aiming (and succeeding) to future-proof the platform, and last year’s turn towards providing the most adaptable, feature-full and secure enterprise LMS. 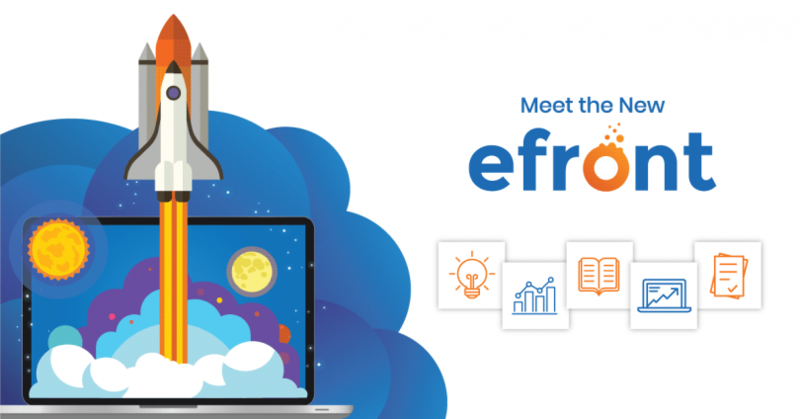 This renewed focus doesn’t represent a pivot, as eFront has always been about offering an advanced and fully customizable enterprise environment – we’ve just decided to fully embrace these qualities, and run with them. We have already been working towards these goals, and some early fruits of our work can be found in the current release (5.0), which came out a few months ago. 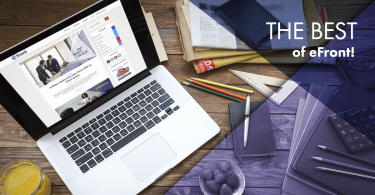 Those include the redesigned eLearning portal UI (including new system icons, a revamped header, and a streamlined Course Catalog), improved and more intuitive administrative pages, Custom Reports, and a more powerful custom Page Builder. These features, along with several architectural changes, help make eFront the industry-leading enterprise LMS, and one especially fit for use cases that call for total adaptability, customizability, and security. Our team is already, busy developing major new features and workflow enhancements for eFront to be released within the year, which we will be disclosing as they get ready for release. To seal the deal, we’ve decided to kickstart 2018 with a great new logo, more streamlined content, and a complete website design overhaul. Fact 1: As a business grows and as a design evolves, a product’s image has to be able to connect with new audiences. Fact 2: Here at Epignosis we’re all about fresh ideas and the courage needed to get right into the action. To reflect these facts, we decided it was time to breathe new life into our beloved eFront. There were two main points of action. First, we wanted to communicate to all of you, both new and existing customers, that eFront does not walk a lonely path. It belongs to a family of eLearning products called Epignosis. Second, we wanted to retain eFront’s familiarity but at the same time go for something more fresh. As expected, we started off by refreshing our logo. We didn’t go for a complete redesign there. Instead, we opted for some smart tweaking. We moved our “thinking” bubbles, from the “e” to the “o”. The “o”, apart from being a lovely little letter, is a circle and as such, it bears some symbolism. For us, it’s all about life and movement, it’s about being timeless, perfect, universal, focused (Sofia, our UX Designer, could go on and on about circles). Then we changed our color palette, to match that of TalentLMS and TalentCards. Finally, we updated our typography, making it simple, clear and at the same time serious. All in all, we believe we created a balance between fun and a seriously heavyweight learning management system. Then, it was the website’s turn for some change. Things were more drastic here as we started on a blank canvas. We simplified our image, using lots of white space and big, easy-to-read typography, few (but quite bold) colors and minimal graphics here and there. We simplified our content, making it easier for you to find information about eFront and create your own demo, or even contact us directly and walk you through our myriad of features. We also improved the website’s performance, which, as you can see for yourself, is lightning fast. So go ahead, enjoy the new eFront website design (seriously, go check it out), if you’re not a user, and Schedule an eFront demo today and supercharge your online training in no time!